Prof. Cheng Man Ching was known as a master of the five excellences. As a teacher, he taught calligraphy and Traditional Chinese Medicine as well as Taijiquan, Push Hands and sword fencing. Advocating Taijiquan as a method of self-cultivation and health-preservation, he also used to teach his Taijiquan students aspects of other Chinese arts. Below, we document four of the massages taught by Prof. Cheng as recalled by Kenneth van Sickle, student of Prof. Cheng Man Ching. The short descriptions are followed by a video demonstrating all four massages. Try to avoid any muscle-contraction while building up massage pressure. The general principles of movement are the same as in the Taiji form. Try to create a flow in the direction in which the massaging part of your body is going. Your state of mind should be meditative. Take your time for the massages and do not think about other things – concentrate on the movement and the exact number of repetitions by counting slowly as you proceed. The kidney massage is the most important of the four massages and should be done regularly. It warms up the kidneys by increasing the blood flow and stimulates the urogenital system as well as the connection of the torso to the legs. Put your hands with the back of your palms in the small cave right between the hip bone and the rib cage at the backside of the body. 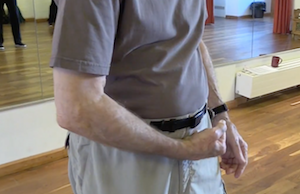 Use your wrists to massage diagonally from the outside down to the inside and back in long strokes, 49 times in and out. Breath normally, let your stomach relax. The stomach massage stimulates the digestion and furthers regularity. If done religiously, it may even take weight out of the stomach due to enhanced circulation in the stomach area. Massage your stomach area by drawing across the lower part of the stomach bowl forming a fist with the palm facing upwards. Then come up at the side and continue drawing across the upper part of the stomach bowl, the palm now facing downwards. Go around the stomach bowl describing a circle, 36 times. Do not dig too deep, but do not circle to lightly either – doing a massage, you should at least focus on the tissues below the skin. The eye massage helps against troubled or tired eyes; it also clears the vision. Shortly after the massage the eyes should feel brighter due to the relaxation of the muscles surrounding the eyes. Both eyes are massaged simultaneously. 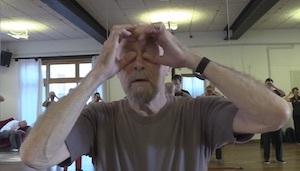 The outer knuckles of the thumbs massage around the eye orb while the other fingers rest above the eyes to provide consistency for the movement. The thumb knuckles go across the top of the eyes towards the nose, then down and at the bottom towards the ears and back to the top. Circle in this way around the eyes for 36 times. Keep your eyes closed during the massage. If you want to do this regularly, try to find the right time of day, when the skin surrounding your eyes is not too dry. If the skin is too dry, but your eyes need a massage, use a bit of water to moisten it. Then the massage should feel comfortable. The finger massage helps against arthritis problems, poor circulation (cold hands) and the feeling of tension in the hands. It can also be used when objects were held too tightly (e.g. some Taiji weapon or a pen after much writing) or the hands feel stiff due to prolonged computer work. The finger massage stimulates the circulation in the shoulder girdle and thus is also able to release increased tension in the shoulders or to relieve headaches resulting from tense postures of the upper body. 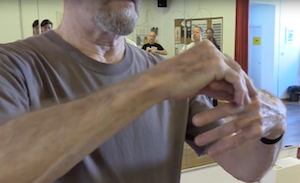 Pull lightly up from the root of the fingers to the fingertips, 21 times on the first three fingers (thumb, index finger middle finger), then down in the opposite direction on the two remaining fingers, also 21 times.